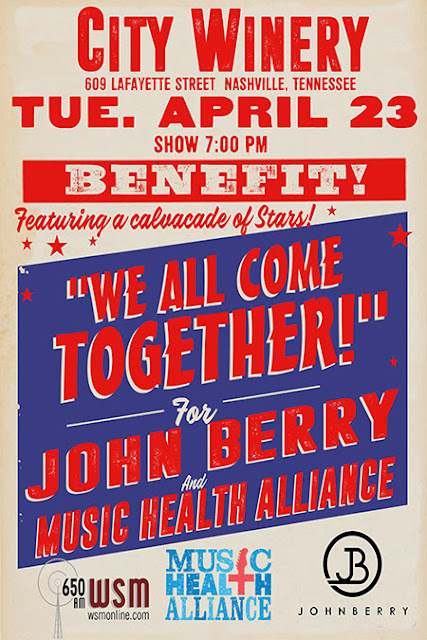 “We All Come Together" for John Berry and Music Health Alliance, a benefit concert scheduled for April 23 at City Winery will raise money to offset the medical expenses not covered by insurance for John Berry, who was diagnosed with throat cancer in January. A portion of the ticket sales will go to Music Health Alliance to fund financial assistance to others in the music community. Tickets can be purchased here. "Wow! We are completely and utterly overwhelmed at the outpouring of love and care for both of us during this time. The music community has all come together for us and we are humbled to be friends with such an amazing group of artists and proud to be part of an industry that cares so much for each other,” said John and Robin Berry. “A few years ago we were faced with the daunting task of finding health insurance for our family. Music Health Alliance stepped in and expertly guided us through the process to find the plan that was right for us. We introduced our band and fellow musician friends to this incredible organization because it’s always good to have help navigating through the maze of health insurance options and Music Health Alliance made the task manageable."